**Book received for review. All thoughts are 100% my own. 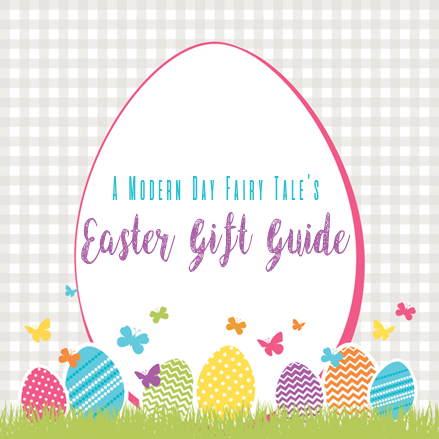 Yesterday, we started off my first ever Easter gift guide with a fun new Bible that was perfect for children- boys and girls- around the ages of 6-10. But what about the younger kiddos? Young children will delight in the pages of NKJV Precious Prayers, a Precious Moments® Bible. Full of the beloved Precious Moments® artwork and dozens of pages of full-color bonus material, this classic Bible will be a family treasure for years to come. Written in the trustworthy New King James Version, this full-text Bible includes a special eight-page personalization area to record each child’s very own precious moments and events. 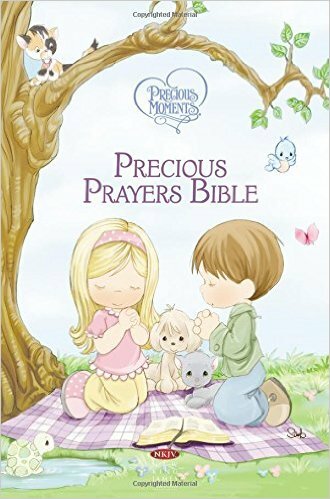 Sixty-four color pages of classic children’s prayers are spread throughout NKJV Precious Moments® Precious Prayers, including themes of thanks, prayers of praise, prayers for school, for mealtime, for bedtime, for family, and so much more. Young children will learn and embrace these prayers that will become lifetime favorites. Write down your little one’s prayers on full-color pages, creating a beautiful way to forever capture the innocence of their early faith journey! Featuring adorable Precious Moments® characters, this beautiful plush padded Bible with soft, eye-catching embellishments will be a treasured keepsake in any child’s library. Children will be drawn to the soft, inviting illustrations, and parents will enjoy teaching the heartfelt prayers and the scriptures from the trustworthy New King James Version®. Since 1978, Precious Moments has grown into an evergreen brand recognized worldwide, with more than 13 million books and Bibles sold. It is one of the most recognized and beloved licenses on the market today. Now, I must admit, I wasn't 100% sure about this Bible at first for one simple reason--- the translation. Personally, I don't prefer the NKJV translation for every day reading. Still, I know that it has its place and we loved the style of the Bible itself, so for her first Bible, I thought it would still be a great choice. My daughter was already fairly familiar with Precious Moments through our church. In fact, one of her favorite blankets is her 'church blanket' featuring a sweet Precious Moments design. So, I knew that the artwork would catch her attention. And I was right! She was so thrilled to have her very own Bible featuring this look she already knew and loved. Inside, we found even more Precious Moments illustrations with sweet prayers for children to read and learn. Some of these were prayers I had read before, others were new, but all certainly fit the description of 'precious prayers'. Again, at three years old, my daughter isn't going to be reading the Bible... but she IS at a stage where she is learning to pray and this Bible is the perfect re-enforcement for that! We are loving reading these prayers and so look forward to learn and use them as she grows older. This truly was the perfect starting Bible for my little girl, and the perfect addition to any Easter basket! The NKJV Precious Moments Precious Prayers Bible is available to purchase now. Omgosh I LOVE this!! Precious Moments were SO popular when I was growing up!! They totally remind me of my childhood! !